Philip Gomm had been a writer for fifteen years before he became an author. As a general and political reporter for ITV national and regional news, and occasional contributor to the print media, he covered many big events and met a whole host of fascinating people. But it was while on assignment in Afghanistan that a chance encounter with Captain Doug Beattie MC finally led to his first book, the critically acclaimed and commercially successful An Ordinary Soldier, which was followed a year later by the sequel Task Force Helmand. 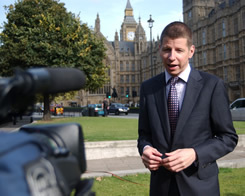 Phil studied politics at the London School of Economics before doing a postgraduate diploma in broadcast journalism at the University of Wales.